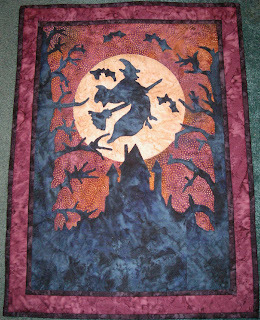 All Things Crafty: Halloween Wall Hanging Completed!! I spent the last week taking little steps to finished the Halloween wall hanging before it's too late and Halloween is already here. 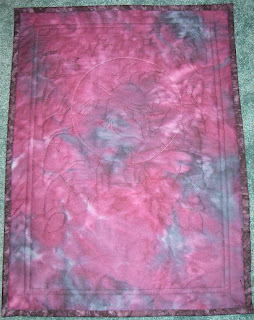 On Monday through Thursday, I did a little sewing each night to complete the sew down of the applique. I tried the quilting foot I was sooo raving about a post or two ago, didn't work for this type of work. It was hard for me to see the applique edge through the foot. So, I return to the zig zag foot. 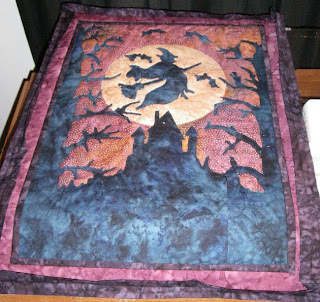 Since there are so many twists and turns on this quilt, I decided to get as close to the edge as I could. Tough job but I got through it. It's not the prettiest, but, hopefully it won't be inspected so closely. I alternated through straight stitch and zig zag and I even returned to the clear thread to sew down the moon. I am so happy with the turn out. Here are some of the steps along the way.